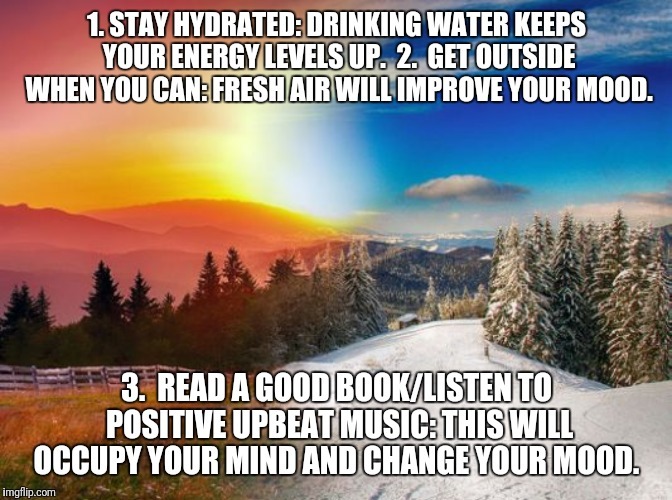 3 Simple tips to improve your mood. 1. STAY HYDRATED: DRINKING WATER KEEPS YOUR ENERGY LEVELS UP. 2. GET OUTSIDE WHEN YOU CAN: FRESH AIR WILL IMPROVE YOUR MOOD. 3. READ A GOOD BOOK/LISTEN TO POSITIVE UPBEAT MUSIC: THIS WILL OCCUPY YOUR MIND AND CHANGE YOUR MOOD.